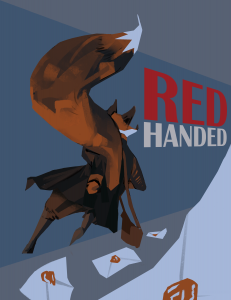 Red-Handed is an isometric stealth game without combat. You are an intelligence operative infiltrating an enemy base, disguised as an enemy soldier. You must gather information, obtain vital documents and generally attempt to destabilize the enemy war effort. You are also a fox. You cannot hide in the shadows, you cannot sneak through vents; all of your espionage activities will be conducted in broad daylight, under the noses of high-ranking enemy officers. Try not to arouse suspicion.